Ipoh Hindraf 6 case speedily fixed for Hearing on 20/7/11 despite prosecution documents not served. This matter came up for Mention this morning before the Ipoh Magistrates Court Magistrate Mohamad Nasrudin bin Mohamad. The Deputy Public Prosecutor was En.Ariff and Augustine Anthony was the pro bono lawyer representing all six of the HINDRAF activists. Case documents from the DPP’s office which should have been submitted to the Hindraf activists before proceeding with that case what more charging in the court. But this is UMNO’s court anything goes. Malay-sia – Semua boleh. Note: Never in any part of the world has any human being been prosecuted for being a member of a Human Rights NGO except in absolute monarchy Saudi Arabia. But this has happened in One Malay-sia. To this effect Malay-sia has created history in being the first democratic country in the world to have ever prosecuted it’s citizen for merely being a member of a Human Rights NGO. 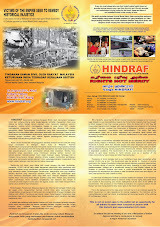 Despite four International NGO’s namely Amnesty International, Front Line Defenders, Human Rights Watch and OHMT writing to One Malay-sia Prime Minister Najib Tun Razak the racist and religious supremacist policies targeted against the Malaysian Indian poor the UMNO regime to stop Hindraf from further continuing to champion the cause of the Malaysian Indian poor has maliciously chosen to racially profile and prosecute these 6 Hindraf activists irrespective. Racist UMNO non implementation of Tun Razak Estate Workers Housing Scheme and Indian villages denied land titles cause of critical Indian poor problems today. The Malay Muslims, Orang Asli, Kadazan, Iban were all granted land titles for the villages they lived in. Even for the 541 Chinese New Villages, land titles were issued. But the Indian poor were denied their similar rightful land titles. Hundreds of Indian settlements like Kg.Muniandy, Kg.Karupiah, Kg.Ghandis, Kg Buah Pala etc were “ethnically cleansed” by the UMNO regime and the Indian poor denied the social safety net as what the poor Malay muslims, Orang Asli, Kadazan, Iban and the Chinese have today. All because the Indian poor were/are gulliable and soft targets. UMNO Malay-sian Judge, lawyers, DPP and police threatens gallows and arm twists Indian youths to plead guilty to 7 years jail and 10 rotan. HRP letter to PM. Re: 1. Justice denied because Legal aid and Bail denied to Indian poor prisoners. 2. Royal Commission of Inquiry for full and real Legal Aid. 3.Alarming 45% of country’s crime committed by the 8% Indian population. 4. Give Indian youths skills, vocational training, business entrepreneurial and land ownership oppurtunities and bank loans and get them out of crime. 5. Appeal to Pardons Board to commute seven (7) years jail sentence and ten (10) rotan and release two prisoners. Justice denied because denied legal aid and bail cannot be the law of this country or any country for that matter especially with a seven (7) year long jail sentence and ten (10) strokes of the rotan. This culture has to change. a) Kajendran a/l Subramaniam ang Sugendran a/l Mutiah were charged for drug trafficking when the net weight of Ganja they were alleged to have trafficked was 291.3kg when it should have been in excess of the 300 kg that is required for a charge under Section 39B of the Dangerous Drugs Act which carries the death penalty. Using this “leverage” of the “fatal” death penalty this family had this morning complained to us that their loved ones were coerced and / or forced into a corner to pleading guilty to a lesser charge under Section 39(A)(2) and were given a jail sentence of seven (7) years jail and ten (10) strokes of the rotan each. Yesterday Madam Murugama a/p Thangarajah informed us that the presiding Judge Y.A. Kamarudin Bin Hashim when hearing the fourth witness displayed his anger, made it “difficult” for the lawyer and “ had made up his mind on the death sentence if the “offer” of the Deputy Public Prosecutor of seven(7) years jail and ten (10) strokes of the rotan was not taken up. The Judge had then met the Defense lawyers in his Chambers. The Legal Aid lawyer one Miss Amy had also coerced and/ or forced into a corner the other accused Sugendran a/l Mutiah to sign the plea guilty form. Miss Amy even this morning was said to be coercing Sugendran a/l Mutiah to sign the plea guilty forms “or he would be sent to the gallows”. The complainant informs us that the accused and his family were confused and did not have much of a choice and pushed to a corner when given the option of the death penalty or seven (7) years jail and ten (10) strokes of the rotan to choose from. The family of the accused also did not have any more money to engage another lawyer and the accused were denied bail and were “forced” to plead guilty. Justice must not only be done but must manifestedly and undoubtedly be seen to be done. And the Legal Principal that a man is innocent until proven guilty should be seen not to be compromised but must be seen to be done. In one of the cases we ourselves have taken up, the state has even not spared denied birth certificate and then denied school to 14 year old Mughilan a/l Mahendran who was alleged to have been maliciously prosecuted for outraging the modesty of a girl in a public area swimming pool in broad daylight. Unable to afford the bail of a mere RM 1,700.00 Mughilan was sent to jail and his natural decision would be to plead guilty irrespective of wheter he was guilty or not and add on to the Indian criminal statistics. We have also received tens of complaints of the police racially profiling and targetting Indian youths and then arresting and prosecuting them when they claim they had committed no crime for example Vinodkumar a/l Nagendran, Saravanan a/l Rajadran and Vijayakumar a/l Rajadran who were last month released from the police custody on our rare urgent latter to the Wilayah Persekutuan Prosecution Department. Had they been maliciously prosecuted , unable to afford the bail and lawyer’s fees they would have similarly ended up pleading guilty and would have otherwise collected their criminal records as well. We believe “plea of guilty” of these instances has immensely contributed to the 45% of Malaysian’s crime being committed by the Indians “statistics”. Every day we have to turn down tens of such cases as we do not have the capacity to handle them. This problem can only be effectively solved at the highest political level and by political will. Based on the tens of complaints we have received nationwide the aforementioned cases are just the tip of the iceberg of especially the Indian poor being forced to plead guilty when they may or may not be guilty. We are particularly alarmed and concerned as to why when the Indians form a mere 8% of the country’s population, they are on the record (mostly by these pleas of guilty) to have committed some 45% of the country’s crimes. This criminal record is going to make life any better for them as they now will be denied even for example a taxi or lorry license and many other jobs and job opportunities. 1. Call for a Royal Commission of Inquiry with the view to implement an effective and real Legal Aid system as per the United States model. The one off RM 5 Million Legal aid announced by the Prime Minister on 25/2/2011 (NST 26/2/11) cannot be a serious and effective legal aid scheme as it obviously did not reach the real needy cases like the two (2) accused in this case and tens of thousands of others. 2. All poor needy and deserving Indians be granted skills and vocational training, business and entrepreneurial opportunities and CGC, Tekun, SMI, SME Bank Industry and Commercial Bank loans etc to bring down the alarming crime rate at 45% of Indians committing crimes in Malaysia when they only form some 8% of the country’s population. 3. That the Prime Minister recommends that the Pardons Board commutes the seven (7) years jail sentence and ten (10) strokes of the rotan on these two aforesaid accused.